Road signs regulate the flow of traffic, warn drivers of safety hazards and road conditions, and guide them to travelers' services and assistance. Once you learn the basic shapes, colors, and symbols, you will be able recognize road signs from a distance or in poor weather conditions. Sign shapes and colors standardize and simplify road regulations, warnings, guidance, and directions so everyone can understand them. For example, the most recognizable road signs are the red octagon STOP sign and the upside down triangle YIELD sign. Road sign shapes represent regulatory commands, give a traveler guidance and direction, and warn of hazards or conditions ahead. Nine standard shapes are used in road signs in the United States. Road sign colors also encode regulatory commands, directions, warnings, road conditions, and motorists' assistance and services. There are seven basic colors used for road signs in the United States. Note that though road symbols are universal, the meanings of shapes and colors in other countries, such the United Kingdom, differ from those in the U. S.
Click to download Learning Road Sign Safety printable. 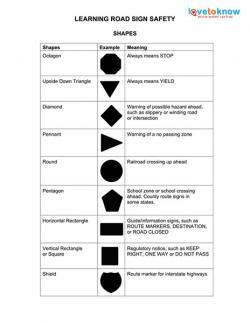 Download and print a useful resource of the standard road signs shapes and colors for learning or as a reference. If you need help in downloading printable adobe PDF files, follow these instructions. 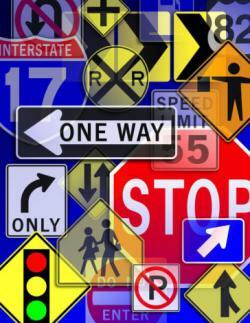 Learn more about road signs and safety from the following resources. The Manual on Uniform Traffic Control Devices (MUTCDs) handbook from the United States Department of Transportation (DOT) is an excellent source for more information on standard road signs used in the U. S. It is the official publication of the Federal Highway Administration and is available for free download. The Manual of Traffic Signs has a detailed listing and explanation of traffic signs, colors, shapes, and specific signs used in the United States. You can download information on several regulatory, warning, and temporary traffic control road signs, among others. The Massachusetts Registry of Motor Vehicles guide to traffic signs provides great explanations for U. S. and Massachusetts state-specific road signs. Road signs are essential to traffic control and safe driving. Protect yourself and others and follow regulations by learning the meaning of road sign shapes, colors, and symbols.